Let's have a drink after work! Stop by The Otis Bar any time after 5pm (Happy Hour’s til 7pm) on April 4th for a drink and apps/dinner with your SLA-SCC colleagues! The Otis Bar in La Grande Orange Café is located at 260 S. Raymond Ave. (between E. Green St. and E. Del Mar Blvd.) in Pasadena, inside the Historic Del Mar Station built in 1934. The Mission Revival-style station was formerly the Santa Fe Depot of the famed Atchison, Topeka & Santa Fe Railway. 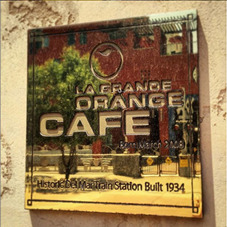 After Amtrak discontinued passenger train service to Pasadena in 1994, the depot sat dormant for many years before being reincarnated as La Grande Orange Café in 2008. It’s adjacent to Metro’s Gold Line Del Mar station stop. LGO will validate for two free hours of parking at the city parking structure northwest of the restaurant at 33 Green St. between Fair Oaks Ave. and Raymond Ave. Valet parking is also available.